Speakers, partners, bloggers… creating a conference like Spark.me means, among other things, booking a lot of flights. One of those flights holds a very special place in our hearts – the one that brought our dear Sanja Gardasevic back to Montenegro from London, where she’s working on her master thesis. Spark.me wouldn’t be what it is without her on the stage, and we were privileged to have her open the second day of the conference. As the opening keynote of the day we welcomed Denise Lee Yohn on stage! She shared a blueprint on how the big brands approach building a great connection with the customers. Building a great brand takes more than pretty posters and gimmicky loyalty programs. Best brands use their brand differently – their brand is not a logo, but every aspect of what they do and how they do it. They pick their stakeholders in order to make sure that the decisions are made and influenced only by the people who share the same values. Their company culture is the most important part of their brands, and their marketing is based not on selling a product – but on sharing the experience their product inspires in people. In Denise’s words, following trends comes with a downside of doing things that everyone else does, and limits your capacity for innovation. Great brands create their own trends, and they do not chase customers. Comparing Red Bull and Monster Energy, she has shown us how creating a premium brand and connecting it to experiences and values, has created an atmosphere in which people are proudly coming to a brand, and not the other way around. The greatest brands are built not as a promise, but as a promise delivered. When we hear that song, but we don’t know it’s name, we Shazam it. But do you know how this app works? Does it have millions of minions on the other side that listen to your song and give you the accurate name of the song you are listening to? The inspiring startup story about how this app developed came from Dhiraj Mukherjee, one of its co-founders. Being of an analytical type, Dhiraj calculated his chances of converting the idea that they had into a successful business were mere 4% – so he enthusiastically quit his job and started working with his teammates on the idea. What matters the most when building a successful startup in his words is having a great team, and enjoying the entire experience. Telling the story of how Shazam came to being certainly lit the spark in Dhiraj, and he transferred his passion to us and encouraged the Spark.me audience to go on their next startup adventure. Boyd Multerer, Xbox’s father of invention, talked about “extreme engineering” – a case where engineering is applied on a fixed hardware during a long time, with a goal of pushing what is given to you to the extreme limit. This kind of engineering has a tendency to very early predict the problems “normal” engineers will face years or decades later. Even if the first thought of this term brings images of military and NASA, extreme engineering is found much closer to us, inside game consoles, where software developers push the same hardware to its limit during console lifespans that can last up to a decade. The problems video-game consoles had faced decades ago are starting to become everyday problems for all the other industries now, and range from consistency, to security, to planned and efficient supporting of the same piece of software across a multitude of devices. Thinking about these experiences, you can make a better prediction of issues you will face in the future. In a world-exclusive reveal, Boyd has announced that his new company will focus on creating a new, self-aware way that devices (primarily IOT) will behave and communicate in the future. His suggestion to developers on the conference was to start learning programming languages built specifically for parallelization (more precisely – Elixir, built on the base set by Erlang, a solution to an extreme engineering problem from 32 years ago), as the existing software is written in languages that make it very hard to squeeze every drop from today’s hardware. We were glad to welcome back two speakers who were at our conference before – Matt Desmier and Dave Birss. Considering the fact that today it is expected that your company delivers on the premise of having a good product, what else does it have to do to earn the trust of the customers? When establishing your branding strategy you need to start with – Why? What is the core reason for the existence of your company? It’s not the money, that’s the result of the process. The reason why your company exists is a purpose, a cause or a belief that you share. For example, Matt brought us the great example of TATA in India – their purpose is being committed to improving the quality of life of the communities they serve, and not just making the profit. 20% of the profits of this conglomerate is being used every year to build schools and infrastructure in the locations that they serve in India. However, Matt noted to us that the way in which they push that purpose forward is not necessarily positive. In summary – to build a brand in the post-truth era that people will trust – Yes, you have to have a good product. Yes, you have to have a good promise. But also you have to have a purpose, and principles as well. What does it mean to be creative? Is it a specific part of your brain that some people do have and others don’t? 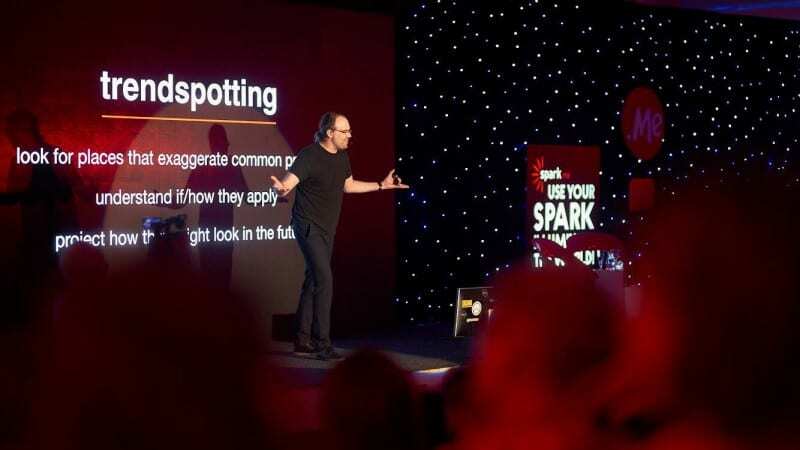 Dave Birss came on stage and explained to us why there is no such skill as creativity – but it is rather a skill set of many other traits that a certain person has. First of all we need to separate creativity in doing and thinking. Creative doing demands you being a specialist. Takes a certain amount of dysfunction. But creative thinking is something we all can do. The way to get better at creative thinking is having the drive to make things better. To aim for the stuff that lie above the norm. To be different. Dave challenged us to be constructive contrarians, to oppose the status-quo, but in a way that we offer a constructive critique of it. The creativity is not a solo sport. You have to work with a great team to make great things happen. 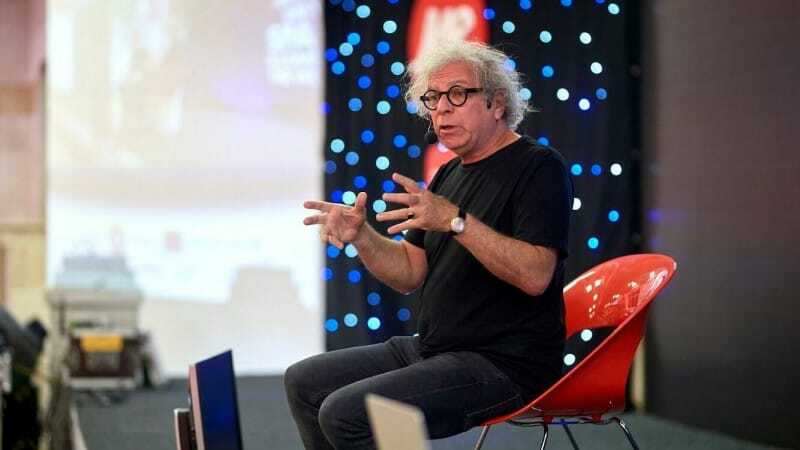 When the conference ended with the speech of Itay Talgam, the thing that bugged me was – How the hell am I going to put in words the experience that I just witnessed?! 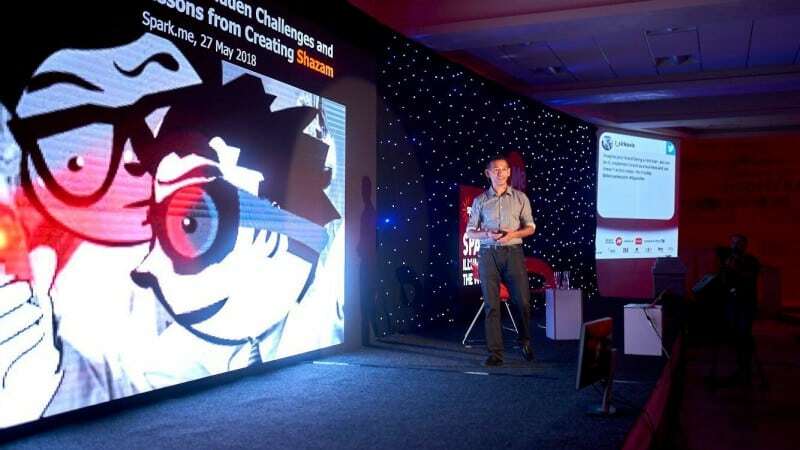 Allow me to explain – there are certain things about this conference in the organizational sense that always push the boundaries forward, year after year. This year’s ending of the conference really did so, thanks to Maestro Talgam. 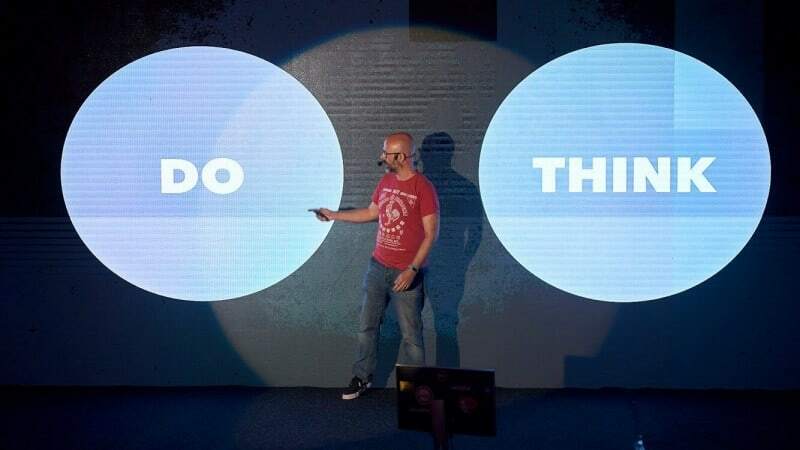 In a lit up conference room, we were all side by side singing and tuning our attention as the great Maestro asked from us, in order to better understand what it means to successfully lead a team. Creativeness needs some tolerance for making mistakes. Jazz musicians say something like – I did all the right mistakes during my performance tonight. That’s because they learn a lot from them and next time they will push the boundaries further and perform better. Talgam’s advice for us is to create the culture in our teams where the people are not afraid to stop and look at the mistakes they made. We explored distinctive styles of the world famous conductors with different approaches to maximizing control and creativity to do things above of what’s expected at the same time. How can you be with someone and support them without choking them when you want them to do their best is an art in itself. When you put your own vision above all the ideas of the team that you are leading and not allow them to be heard, they will likely backfire. Great conductors know how they want the piece to be played before the concert, but they are perfectly aware of their own ignorance and accept it. That’s because they know that they don’t have all the knowledge and creativity of this world, and that their orchestra probably can come up with better ideas than they can imagine. I will leave this video of Carlos Kleiber conducting here, so that by watching it you can understand at least a little bit of what Maestro Talgam discussed with us. Start-up finals consisted of shorter, 3-minute pitches in which the finalists were trying to convince the judges not only that they are the best startup in the competition, but also that the TechCrunch Disrupt appearance (the winner gets a trip to San Francisco and a place in the Startup Alley at TCD) will mean the most for their project. 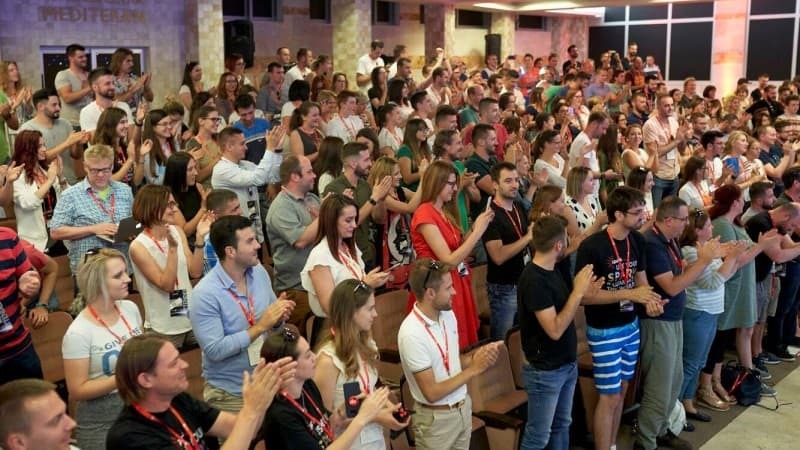 Other than the two obvious finalists – Hoteo and Top Digital Agency, the place in the finals was given to a Montenegrin startup Marleq, which is in a very early stage. Spark.me judges have a great record of finding not-so-flashy startups that would later turn to be a complete success (look no further than last year’s winner), and we hope the greatness also awaits this small Montenegrin team, along with two other finalists. 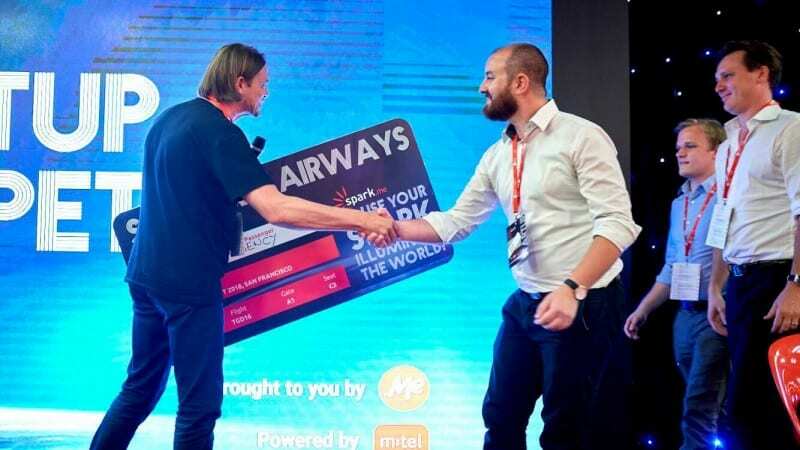 The winner was announced, and it was Top Digital Agency, an online platform that connects digital agencies and clients across the world. Other than having a great service and respectable traction, this year’s winner has had one of the tightest, most well rehearsed pitches we’ve seen on our stage. We hope their pitches in San Francisco will impress the investors the same way their pitches in Budva have impressed our jury.